As I started to check the facts for this article I planned to title it ‘How to Open a Free UK Bank Account Online’. Lateron I had to omit the word ‘Free’ – see below, but it still is a bank account that anyone in Europe can open online, all that is needed is an Android smartphone. That’s right, it is not limited to British expats, but open to anyone living in Europe. There is no iPhone App yet, but it is planned. For the UK p2p lending marketplaces I use as a non-UK resident, a bank account in the UK is not really necessary. I use Transferwise and Currencyfair to transfer money and handle the currency exchange. One process where I think having a UK bank account is very useful, is when I want to withdraw money from one UK p2p lending marketplace in order to then deposit it at another UK p2p lending marketplace. Naturally in that scenario, I do not want to convert the pounds back to Euro and I want the transfer to be fee-free. Therefore I looked for a bank account, that would allow me to do this online. Another requirement was that I should be able to open this bank account without traveling to the UK and entering a bank branch. I opened a Monese current account. To do this, I first downloaded the Monese app on my Android phone. Then it took about 10 minutes to register. In the course of the process I took photos of the front and the backside of my ID, did a selfie (smile) and filled in a form. That part was completed rather fast. After that I had an unverified account, which had some restrictions. To lift these I uploaded the PDF of a recent bill with my name and address on it and waited. It took about 6 days until my account was verified. I have an own bank account number. Together with the sort code (which actually is the one of NatWest since Monese cooperates with NatWest) I can transfer money inside the UK fast and free. This is the main function for me. The account has more features, but actually I won’t be using these. Should I want to transfer money from my Monese account to my Eurozone accounts I will continue to use Transferwise or Currencyfair instead of making the transfer as I currently think this is the best way to optimise forex rates and at the same time minimize transaction charges. Is this a free account? When I signed up on March 18th, Monese promoted it as a free account. And in fact my account still is, I don’t pay a monthly fee and the transaction types I want to use are still free in my account (see screenshot). Other features – which I do not need like an ATM withdrawal or a card purchase abroad are priced. But I talked to other investors, who signed up later than me (last week) and they were offered by Monese ‘First month free 4.95 GBP/ month‘. 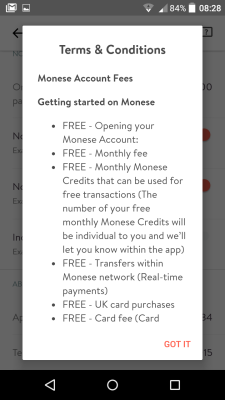 Seemingly Monese no longer offers accounts without a monthly charge to new customers (if this is uncorrect and it is still possible to get open an account without monthly fees applied, please post hints and tips how to do it in the comments. Thx!). It should be noted that the account is not covered by FSCS as it is regulated as an e-money product. The app so far does what it should and is self-explanatory, if a bit basic. 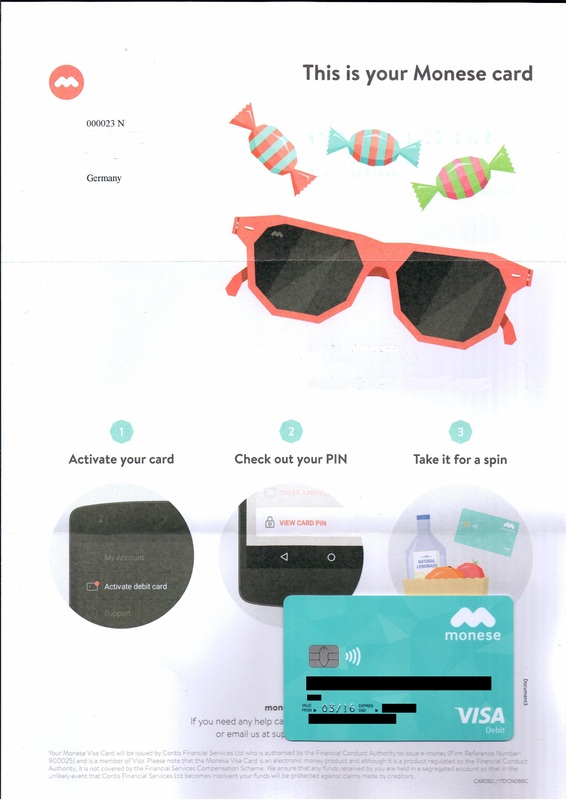 About a week after I opened the account I received a welcome letter with a VISA debit card, which I actually don’t need for my intented use of the account. But for other customers it will be useful to have a card with the account. Almost 60 pounds a year is far too much such a simple bank account.